My Blog: When We Need To Take The Rightful Decision. When We Need To Take The Rightful Decision. As The Temperature Of Water Rises, Frog Keeps On Adjusting With Increase In Temperature. 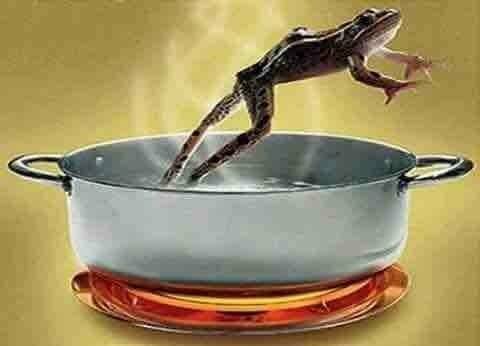 Just When The Water Is About To Reach Boiling Point, The Frog Is Not Able To Adjust Anymore. At That Point The Frog Decides To Jump Out But Is Unable To Do So, Because it Has Lost All Its Strength In Adjusting With The Rising Water Temperature. No, It's Frog's Own Inability "To Decide When It Had To Jump Out." We All Need To Adjust With People And Situations, But We Need To Be Sure When We Need To Take The Rightful Decision. Che fortuna non essere una rana.